Surface texture of a hardwood floor can add a lot to the atmosphere for a particular room. It can accentuate the elegance or add to the warmth of a more casual setting. There are a few different surface textures available when it comes to prefinished hardwood flooring. Featured in this post are the top four: smooth, handscraped, distressed and wirebrushed. The most popular surface texture we see in prefinished hardwood flooring is a smooth surface. Floor boards are sanded flat and then finished at the factory. Read about the advantages of factory prefinished flooring here: Prefinished or Unfinished Hardwood Flooring. Hardwood flooring with a smooth surface can definitely enhance the elegance of a room, especially when used in a darker finish. Keep in mind that smooth hardwood floors will show scratches and dents more readily than a more textured hardwood floor. Handscraped surface textures can be anywhere from subtle to extreme. Pictured above is an example of a somewhat moderate handscraped hardwood floor. You can see that there are several indentations and, overall, the board surfaces have a wave like appearance created with the wood scrapers. Handscraped hardwood flooring definitely brings a more casual look to a room, adding warmth, comfort and a lived-in ambiance. The more handscraped texture a hardwood floor has, the more it will hide scratches and dents. Lots of homeowners with larger dogs in their households opt for a handscraped texture in their hardwood floors simply because wear and tear is more easily concealed. When a hardwood floor is listed as distressed, it is typically antiqued, but in a different way than with the handscraped texture. Distress marks could include dents, burn marks or blackening of edges. The goal is to make the hardwood floor look lived on and beaten up. Distressed flooring is perfect for heavy trafficked households or homes with lots of pets, as the polished distressing helps to camouflage any actual dents and scratches that may occur. A hardwood floor which is wirebrushed offers a middle ground texture — between smooth and handscraped. The wirebrushing process is just as it sounds; the finish is lightly scraped with a wirebrush, creating long and linear strokes. 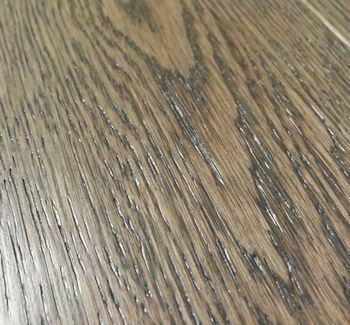 This wirebrushed texture really accentuates linear grain patterns, like that of oak flooring and it makes a hardwood floor a little bit more interesting than if it had just a smooth surface. There are many instances where a specific collection will feature more than one of the textures described above. It’s not unheard of to see a hardwood floor with a handscraped AND distressed look, or a distressed AND wirebrushed style. Just another way of showing homeowners the endless options available; the only limit is (corny, but true) your imagination! Whether completely smooth or featuring a bit of rough texture, the surface feel of a hardwood floor in addition to color and width can definitely add to the milieu of your home. 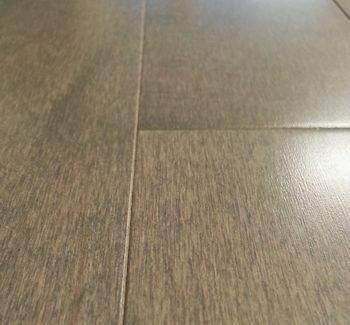 You may also be interested in: Pets and Your Hardwood Flooring, Top Handscraped Collections, Hand Scraped Hardwood Flooring, Customer Expectations When Buying Hardwood Flooring. This entry was posted on Tuesday, January 21st, 2014 at 12:29 pm	and is filed under Hand scraped hardwood flooring. You can follow any responses to this entry through the RSS 2.0 feed. You can leave a response, or trackback from your own site. Over time will a wire-brushed flooring collect dirt and become hard to clean? Wirebrushed flooring does have a texture on the surface of the floor, but the divots aren’t deep enough to collect a lot of dirt or dust. Regular cleaning should be just as easy as with a floor with a smooth surface. 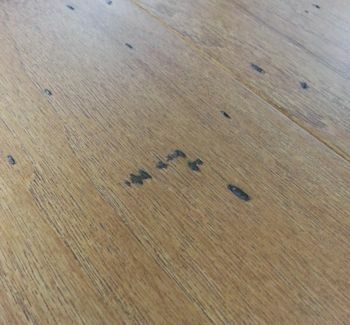 What is the best method of sealing a distressed wire brushed hardwood floor to maintain original colour (or as close to as possible) and minimise upkeep? Sealing a hardwood floor really depends a lot on the specific manufacturer of that floor. We would recommend contacting the manufacturer of your hardwood directly and see what their recommended product would be. You want to make sure that it’s one that they approve of so you don’t end up voiding the finish warranty that came with the floor. 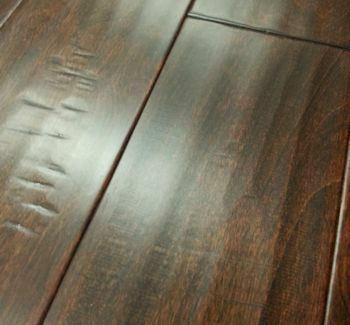 Kids and animals will obviously leave their “mark” on hardwood floors but am wondering if one wears better then another…. we are trying to decide between two floor samples we like a lot; one is a Hickory hand-scraped floor and the other is a wire brushed teak. Any thoughts or suggestions on which way to go would be greatly appreciated. Handscraped floors tend to camouflage a little bit better simply because it’s typically more of a random surface texture, whereas wirebrushed is a little more uniform. Both, though, would hide scratches more than a smooth floor with a semi-gloss sheen.